When and where is covered by the SCA? The SCA covers 1000 years of history finishing around 1600AD and starting about the time of the fall of the Roman Empire in Western Europe. Our core geography is Europe, but we also include all those civilizations which had contact with Europe, which was most of the globe. This means we cover, amongst many others, the Carolingians, the Byzantines, the Anglo-Saxons, the Vikings, the Normans, the Plantagenets, the Hundred Years War, the Wars of the Roses and the Tudors. This leads to the Anachronism in our name as you will see personas from different places and times mingling. We do not concentrate on a single place or event, but the sweep of the medieval period. You can concentrate on one time and place or take a journey of exploration through as much of the history as you have time for. What is there to do in the SCA? The SCA offers a variety of hobbies all wrapped up in one. 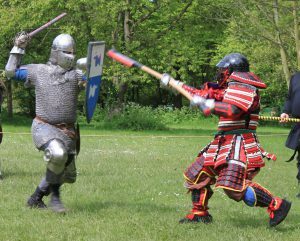 The fighting (armoured and fencing) is the most noticeable activity, with fighters at all levels to assist and teach both men and women in the art of combat and war. However if bruises are not on your to do list, there are plenty of other activities. The SCA offers involvement for almost every person of any age with an interest in history. 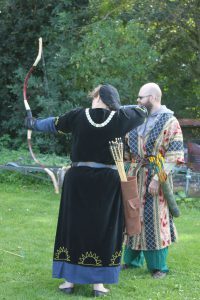 There are archery, medieval dance, cooking and feasting, mead/beer brewing and drinking, heraldry and pagentry, scribing and calligraphy, weaving, sewing, costuming, leather working, carpentry and smithing in a variety of metals. The list goes on for as far as your own imagination allows it. 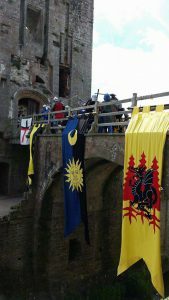 In the SCA you can share your particular historical interest and learn others in the context of a whole community and socialize with other historical enthusiasts. Getting involved is easy, simply show up to a meeting, fighter practice or if you prefer a more formal approach, contact the Chatelain, the group’s welcoming liaison. You can get involved as much or as little as you chose. The SCA is a strictly voluntary organisation. We welcome and encourage new members. Paid membership is not needed to participate, and you can simply show up and play. If you wish to become a member, click here. Once around the group you will find plenty of people to assist you in getting involved and re-creating your part in living history. Whilst we use both Yahoo and Facebook (see the links in the menu bar), the Yahoo Group is currently designated as the official route for announcements, updates, etc. Most announcements will also be reflected on Facebook, but note that not everyone will see responses there. We also endeavour to keep the website up to date, but it is impossible to keep it so in real time, especially during events.